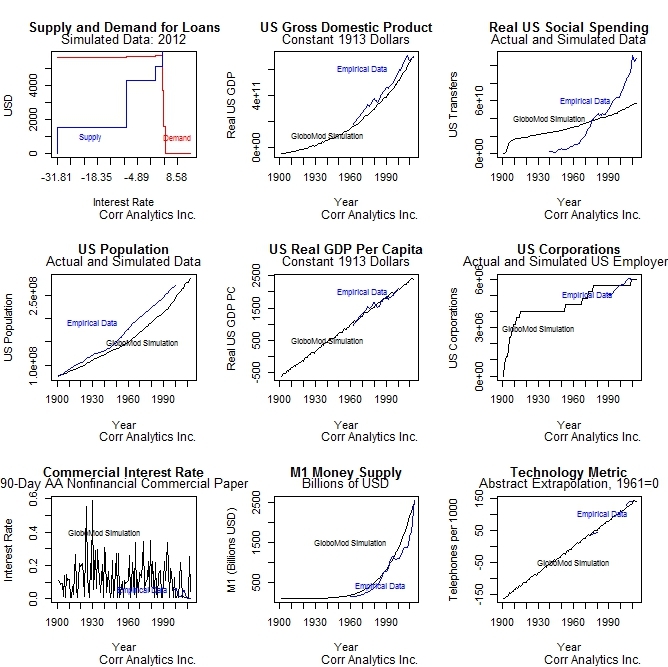 GloboMod | Corr Analytics Inc.
GloboMod Agent-Based Simulation of United States Macroeconomic Variables. Original agents include households only. Telephone data is from the World Bank and UNDP. 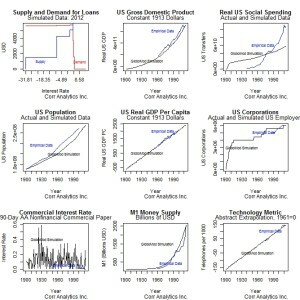 US GDP data from 1961 to 2012 is from the World Bank. US employer and population data from 1900 to 1999 is from the US Census Bureau. Budgetary data on US social spending is from the US White House. GloboMod is an agent-based model (ABM) of the macroeconomic system produced by Corr Analytics to predict, determine and test optimal macroeconomic policy and investment strategy. GloboMod is the first agent-based model that analyzes the financial sector by building it from the granular level of households. This allows modeling of individual investor effects such as crowding, speculation, and bank runs. It is the first to use genetic evolution in the context of a macroeconomic model to eliminate bankrupt corporate agents and reproduce corporate agents with winning strategies. GloboMod is under development, and will also be the first agent-based macroeconomic model to account for politics, including partisan votes on taxes, politicians that compete for voters by implementing tax and regulatory change, jurisdictions with different tax and regulatory strategies, and investor choice between jurisdictions. GloboMod is implemented with agents having bounded rationality and asymmetric information, and is verified against empirical data. The simulation is continuously under development, and uses the object-oriented R statistical programming language.